Armed with a Paul Westerberg obsession and a desire to create straight-ahead, heartfelt rock and roll in true Midwestern fashion, Chicago garage/alternative four-piece The Code Kids are the kind of indie band you can't help but champion. One listen to the energetic crunch of their barroom rock will get you cheering them on, and another will have you shouting along. Last year the band released their debut EP, We Sell It Back to You When You Beg, and they've been gathering listeners through regular gigs ever since. As they get set to play Ronny's this Thursday, April 9 and to record their next EP in next month, singer and guitarist Mike Roffman took some time out to fill us in on the band's inspiration, history and plans for the future. When and how did The Code Kids come together? I left Tallahassee, FL and moved to Chicago in 2007 to work on my Masters in Writing at DePaul. I had been in a few bands back in Florida, one of them being The Pax Romana with Jay [Ziegler], and I wasn’t exactly ready to stop doing that. So, I started tracking songs on my MacBook and e-mailing some of the guitar parts and melodies to Jay, who was still in Tallahassee finishing up his Bachelor’s degree. He would write some lead over them and shoot back the finished results and we’d have these rough demos. In fact, that’s how “Nobody Knows This Is Somewhere” came to be. Once he finally decided to make the move to Chicago, I started looking for potential band mates. Kyle [Masterson] was one of my friends from class here at DePaul, and he was interested in playing bass in just about anything that had to do with rock. So, we started tracking songs, too. 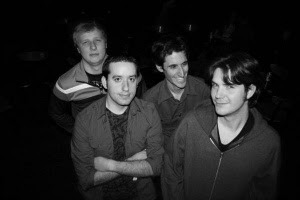 While living in my apartment, Jay found Brad [Cooper], our drummer, through MySpace and things, well, they just clicked. About three of the seven demos came to fruition in like an hour. It was great. The band name itself came from the idea that we’re all NES junkies, especially Brad and Kyle, and we remember these idiot kids who’d sell us fake codes in middle school – something we called “code kids.” It just seemed like a good fit. Coming from Florida, what about Chicago and its music scene appealed to you? Musically, the city is insatiable. You can’t go wrong. It’s obvious music was meant to be here. Chess Records, Smashing Pumpkins, Alkaline Trio, Wesley Willis, Wilco…those are some good things to live for, right? Well, maybe not the Pumpkins anymore, but you get the idea. In all honesty, the Midwest is appealing for one reason: the music has always seemed endearing and honest. How do you describe The Code Kids sound to people unfamiliar with the band? We’re big fans of that Minneapolis sound. I’m obsessed with Paul Westerberg and The Replacements. We all are, but I get a little sick in the head about it. I mean, was it really necessary to buy the guy’s signature First Act guitar? [laughs] There’s just something about his music that seems real to me. It’s a little different than the connection kids get with Nirvana or The Beatles or even Led Zeppelin. Their music just speaks volumes about life to me, and I think a lot of Minneapolis bands do that. The Hold Steady, Hüsker Dü and even Soul Asylum – a lot of these guys just focus more on the reality of things, and that’s appealing and that’s something we go for. I don’t care about the similarities drawn, either. The music that we make speaks to me the same way these bands’ songs do, and that means the world to me. It’s why I feel the need to keep writing. We just might have a little more shredding on top, thanks to Jay. Last year you released your debut EP, We Sell It Back to You When You Beg. As the band’s recorded introduction to the world, what did you most hope to get across in these three songs? The three songs, “Nobody Knows…”, “Andrew McCarthy”, and “Good For You”, were what we had ready at the time, which was back in November. We had some other tunes on the dashboard, but they just weren’t studio ready. Overall, the three songs do us justice. “Nobody Knows…” is about as real to the sound we want, while “Good For You” is a song that was written three years ago and has since transitioned to the rough alternative sound we enjoy. There’s a lo-fi feel to us, and “Andrew McCarthy” has that, what do they call it, “indie” sound. I’m a big fan of what’s available today and I tried writing something a little more modern and “McCarthy” nailed that in a sense. So, in a way, the three songs are a good indicator, but more so of things to come. Tell us about your new EP coming in May. How does it compare to the debut, and why should people check it out? We’re really psyched for the new EP. We’re just broke. Our recent traveling stint across the Midwest hit our pockets hard, and also cut into our studio time. So, we might be left with another three song EP, though I’m pushing for four. We feel this will open more doors for us. The songs this time around have more flavor, they’re catchier and they’re more interesting. One of the songs I can’t wait to record is “How Very.” It has this great little riff and the chorus is fun as hell to hum and there’s this odd reference to Christian Slater. I have this knack for writing about celebrities, because I feel writing about myself lacks a bridge. So, if I can relate these ideas and emotions to something that people might recognize or empathize with, which might be hard with Slater but we’ll see, then I feel there’s a connection. There’s a bit of that with the new songs here, though a more introspective tune like “Moving Walkways” or the somewhat tongue in cheek “Short Circuitry” veer off in a different direction. Simply put, they move and shake. Favorite gig so far and why? We had a great time in Chicago before the tour began. We went on the road with The Orphan Age, who were then called Hammerhead, and our kick off show was just a blast. I was a little blasted, but it made for an entertaining show I guess. On the road, Milwaukee was just amazing, and we met some great bands like The New Loud, who are just great people. Also, there was a good turnout despite the bummer weather. What bands – local or beyond – would you most like to play with? Locally, we’d love to play with The Roadless some more. They opened for us at the Cobra Lounge last month, and they have this killer garage rock sound. Blueblood is another band that I’ve spoken with, and of course, The Orphan Age is fun. Beyond, the wish list never ends. Of course, I’d love to open for Westerberg, but let’s be realistic. We’d have more of a chance at snagging an opening spot for The Hold Steady, and even that seems like a dream. Actually, we contacted The Toadies about getting a spot for their upcoming Metro gig, and I know Brad would have a heart attack if that happened, so we’ll see. As for the other guys, I know Kyle would probably flip out if he ever met Jack White or Jenny Lewis, and Jay, well, he’s similar to me, but he has this Bob Mould fetish. What have you found to be the best part of being an indie band in Chicago so far? The most challenging? The best part is that there are tons of places to play, and with an active scene in booking and promotions, there are plenty of bands and businesses to network with. The most challenging aspect is that there’s a lot of competition since the market is very active. It can be hard to convince people that your music is worth listening to any given night compared to all of the other bands playing around town the same evening. A little time off, actually. Not to relax, though. We’re going to be recording in May. Our Web site needs some changes. And, we’re working on an overall new approach to reaching out to people in the Chicagoland area. Hopefully some bigger shows with some good local bands as well. We have CMJ coming up in October, and that should bring some interesting things with it. How can people find out more about The Code Kids? Ronny's this Thursday, April 9.